dA Streaming Ledger, now available in the River Edition of dA Platform, works as a library for processing event streams across multiple shared states/tables with Serializable ACID Semantics. In this whitepaper, we explain Stateful Stream Processing as the critical technology for businesses to build data-intensive applications and explain some of the limitations of existing stream processing frameworks. 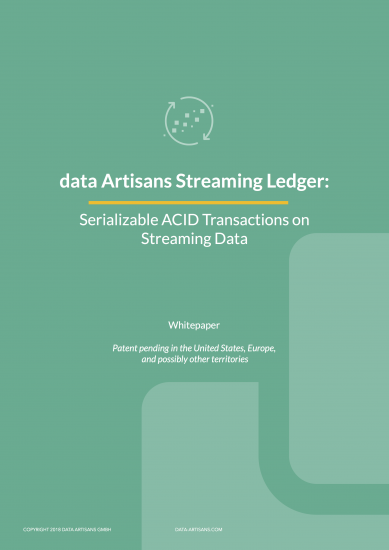 Next, we introduce dA Streaming Ledger, a solution that brings Serializable ACID transactions on data streams. Finally, we describe how dA Streaming Ledger works and name some example use cases for the technology. > Stateful Stream Processing as the technology of choice for companies who want to build data-intensive applications and operate in real time. > dA Streaming Ledger, its functionality, and example use cases. > A step-by-step guide on developing streaming applications with dA Streaming Ledger.